Reflecting on the first College Football Playoff season and preparing for the second. Plus, more Punt, Pass & Pork. By the time Punt, Pass & Pork goes live next week, we’ll finally be in phase one of the college football preseason. We’ll still be weeks away from games, but SEC Media Days will be underway. That means the people who will play and coach football will be talking about football, which isn’t is fun as watching actual football but beats the heck out of the nothing we’ve gotten for the past few months. But before coaches and players dump fresh grist into the mill at their various media days, let’s look back on the first year college football had a playoff and offer a few wishes for the second one. • Even a small bracket is a ton of fun—and produces results we might not expect. New Year’s Day 2015 was the most fun day of college football in a long time. The stakes of the Rose and Sugar bowls combined with the prestige of the programs competing in them made for a thrilling day and set up an interesting championship game matchup. While the first of two game days in a four-team playoff isn’t going to have the same bang-bang-bang intensity of the first two days of the NCAA basketball tournament, the gravity of football’s final four produced tremendous tension. The excitement in the Rose Bowl was palpable, and those who attended the Sugar Bowl have reported the same sensation. Even better, the first year of the College Football Playoff offered an excellent illustration of how differently things might have gone if the BCS were still in place. Alabama and Florida State would have faced off for the national title. In the playoff, neither made it out of the semifinals. Ohio State—the No. 4 seed and the Las Vegas underdog in both of its playoff games—proved to be far and away the best of the bunch by the final whistle. During the BCS era, the powers that be tried hard to convince us that the BCS almost always matched the two best teams. But the conferences in major college football are so different—and there are so few intersectional games between quality foes—that it’s nearly impossible to predict how the best teams from different leagues will stack up until they meet on the field. Maybe last season was the anomaly and the BCS would have gotten the matchup correct, but the 2014 results got me thinking a lot about ’11. I was one of the people that season who thought Oklahoma State could not have beaten Alabama or LSU. Now? I wish the Cowboys had gotten a chance to try. Maybe they would have been the ’14 Buckeyes of that year. Of course, had the Big 12 had voted in favor of a playoff when then-SEC commissioner Mike Slive proposed it in ’08, Oklahoma State probably would have gotten a chance to play for that title. • More teams in the hunt at the end mean more meaningful games. That first Saturday night of December was quite the roller coaster. Baylor was handling Kansas State in Waco, but every drive seemed to be a referendum on the Bears’ standing versus TCU, which had been placed ahead of Baylor in the selection committee’s rankings despite the Bears’ 61-58 win over the Horned Frogs on Oct. 11. Georgia Tech and Florida State were trading scores in the ACC championship game in Charlotte. Meanwhile, Ohio State was playing its third-string quarterback and annihilating Wisconsin in the Big Ten title game in Indianapolis. As we watched, we tried to discern what each score or stop meant. We wondered what the selection committee was thinking as its members watched from a luxury hotel in suburban Dallas. For years, the lords of the BCS—who, it should be noted, are also the lords of the playoff—insisted the playoff would invalidate college football's regular season. Instead, their lies were undone by simple math. More spots available to compete for the championship means more teams remain relevant deep into the season. That made the final few weeks of the 2014 campaign thrilling. • Quit following the horse race. This means you, Staples. When readers would complain to me on Twitter about their team’s ranking last year, I would tell them to relax. The only ranking that matters is the one released on the Sunday after the conference championship games are played. Everything else is strictly for entertainment purposes. The preseason rankings, the AP Poll, the Coaches’ Poll and even the week-to-week committee rankings before the last one are utterly meaningless. They exist to give us something about which to argue. Unfortunately, I didn’t always follow my own advice. Looking back at my coverage of last season, I spent a lot of time delving into committee rankings that ultimately proved meaningless. When chair Jeff Long said the committee started every week with a blank sheet of paper, he wasn’t kidding. So, I will try harder to put those early rankings in proper perspective this year. • That would be easier if the selection committee would help. It would be nice, though, if the committee tried to be consistent in its methodology. We all know the weekly committee rankings in October and November exist solely for the purpose of providing a show for ESPN. That show is wildly popular, and it makes its own gravy by allowing ESPN to spin off content from it on TV, radio and the web. That’s fine. Get money. But the committee needs to be aware that if it takes a hard left turn between its release of the penultimate and final rankings, people will be understandably confused. That’s what happened last season with TCU and Baylor. Going into the final week, TCU was ranked No. 3 and Baylor No. 6. After TCU beat Iowa State 55-3 and Baylor downed Kansas State 38-27, the committee ranked Baylor No. 5 and TCU No. 6. I’ll happily accept any argument that the four teams that made the playoff deserved to get in over the two teams with the best record in the Big 12. That’s a legitimate debate. The problem is TCU never should have been ranked ahead of Baylor in the first place, and the committee would have saved a lot of anger and confusion by simply following its own guidelines. When two résumés are equal and the teams have played one another, the result of that head-to-head matchup should be the tiebreaker. For some reason, committee members didn’t consider the résumés of Baylor and TCU to be roughly equal until the final weekend. That’s when they decided to use Baylor’s win over the Horned Frogs in Waco to elevate the Bears. This made little sense, though. Yes, Baylor’s nonconference schedule was hot garbage, but TCU’s early win over Minnesota wasn’t enough to offset a head-to-head loss to the Bears. The teams were different in Big 12 play, too, but in ways that were offsetting. TCU crushed Texas Tech, while Baylor struggled against the Red Raiders. The Horned Frogs squeaked by Oklahoma, while the Bears hammered the Sooners. The biggest similarities in conference play came in Morgantown. Baylor lost at West Virginia. TCU needed a Jaden Oberkrom field goal as time expired to beat the Mountaineers. Had Baylor been ranked a spot ahead of TCU all along, the Big 12’s exclusion from the playoff field might not have looked so jarring and odd. The reasons behind it were understandable. But TCU’s drop from No. 3 to No. 6 gave rise to a lot of conspiracy theories that might have been avoided. • Two teams from one league may get in, which means two Power Five leagues may get left out. Don’t everybody freak out. There are only four spots. This is going to happen. There probably is not some deeper meaning. The Big 12 didn’t need to make any drastic changes as a result of last year’s omission. That league was actually the closest of any Power Five conference to getting two teams into the playoff. It’s possible 2014 was the anomaly. Now, if the Big 12 gets left out of the field again in ’15, it may be time to add that 13th data point. • Stop worrying about the New Year’s Eve thing. Our Richard Deitsch wrote a column about the playoff holding its semifinals on New Year’s Eve (a Thursday) this season. Logic dictates this will cause a massive ratings dip after last season’s record-shattering performance. People still have to work. The first game will kick off in the early afternoon for the West Coast. Some will want to watch Ryan Seacrest or Pitbull and a falling ball instead of football. CFP executive director Bill Hancock remains adamant that holding the semifinals on New Year’s Eve will change the way Americans celebrate the holiday. Deitsch spoke to Ilan Ben-Hanan, ESPN’s vice president of college sports programming, and Ben-Hanan said the network tried to get the playoff to shift the games to Jan. 2 (a Saturday) just for this season. The CFP declined. 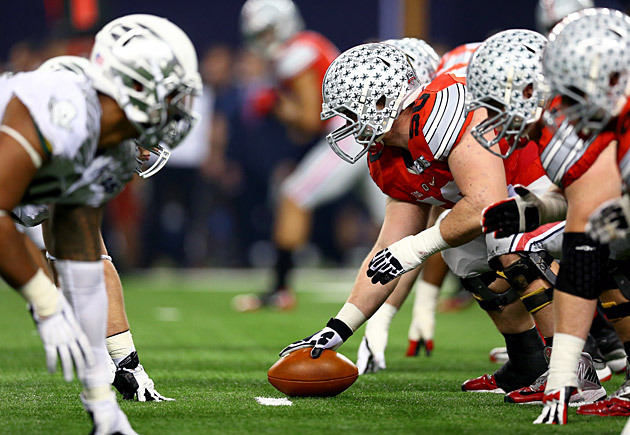 A daunting task: Can the CFP, ESPN change old New Year's Eve habits? Why aren’t the games on New Year’s Day? Because the Rose and Sugar bowls negotiated their time slots with ESPN. For the life of the current contracts, they’ll kick off in (the East Coast’s) mid-afternoon and prime-time slots, respectively, on New Year’s Day. So why wouldn’t the CFP move the games with a Saturday slot available this year? Hancock and company truly believe people will change their New Year’s Eve viewing habits. I tend to agree with them. The ratings won’t be as high as they would have been on New Year’s Day, but I don’t think this will become the disaster most are predicting. Those of us happy to stay home on New Year’s Eve because the bar scene that night is an ultra-expensive amateur hour will be thrilled to watch football instead of the horrendous ball-drop shows. As far as the folks who still have to work, you find reasons to be sick on a Thursday and Friday every March. I’m sure you’ll be creative in this case as well. And if the CFP is wrong, no big deal. It’ll hold the semis on Dec. 31 after the 2016 season. Then the semis will be on Jan. 1 following the ’17 campaign because they will be in the Rose and Sugar bowls. If the New Year’s Eve experiment has failed, the CFP will simply move the semis to a more advantageous date. Of course, by then it’ll already be making plans for when the playoff shifts to eight. A few weeks ago this popped up on my Twitter feed. I hate to tell the website of another venerable magazine how to go about its business, but, no, Esquire. Absolutely not. Even if every designer in Milan parades models wearing garbage bags down the runways, it does not make the look cool, fashionable or remotely functional. It is your editorial imperative to say, “Hey, wait. That looks incredibly stupid.” Hasn’t anyone in your office read The Emperor’s New Giant, Baggy, Quadruple-Pleated Pants? Perhaps it’s time to pick up a copy. Then you won’t wind up convincing sheep to buy these items when they filter into more moderately priced stores. To help you remember the horrors you’ve helped inflict on the populace, here is a list of the five worst fashion trends—male division. Maybe you once owned a pair of JNCOs. You certainly regret that now. These are huge in the sportswriter community. They remain putrid. Katherine Wheelock’s 2007 essay on the subject should be posted at every mall’s entrance. Somewhere along the line, even bargain-khaki shopper Jim Harbaugh got the memo that pleats add only a hint of hopelessness. Here’s Harbaugh with the San Francisco 49ers. The great Spencer Hall of SB Nation once pointed out that the only thing a costume designer must do to turn Matt Damon from a staring-at-the-sun-handsome movie star to a workaday schlub is put him in pleated pants. That sentiment pretty much explains what that garment brings to the table. Yes, I know where I attended college. And yes, I did rock jorts during my freshman year. I disposed of them all in the summer of 1997. For some unknown reason, the University of Florida still allowed me to graduate. They’re nerdy and best worn by 5-year-olds. But whatever. I have a long, fat torso that makes standard ties look like napkins. Bow ties work for me, and anyone can wear anything—even square-toed shoes—as long as they believe they can. Except maybe those pants from that Esquire tweet. Those are truly hideous. 1. Colin Cowherd’s uncomfortable segment with Jim Harbaugh on Cowherd’s ESPN Radio show last week had a lot of armchair psychologists analyzing the interviewee and the interviewer. I hate to trample on fun speculation, but some interviews just don’t work out. I have been on both sides of the bad-interview equation—me asking bad questions and getting blown up and me getting asked bad questions and getting surly—and it’s never fun for either party. Luckily for me, the interviews I’ve torpedoed with my questions weren’t broadcast on live radio. Some people will let an interviewer slide with very general questions. As a coach, Mack Brown was going to make every interview a good one no matter what he was asked. Rich Rodriguez always has a wealth of great stories. Steve Spurrier may not answer the question being asked, but he knows when he’s on, and he’ll always take the discussion to an interesting place. 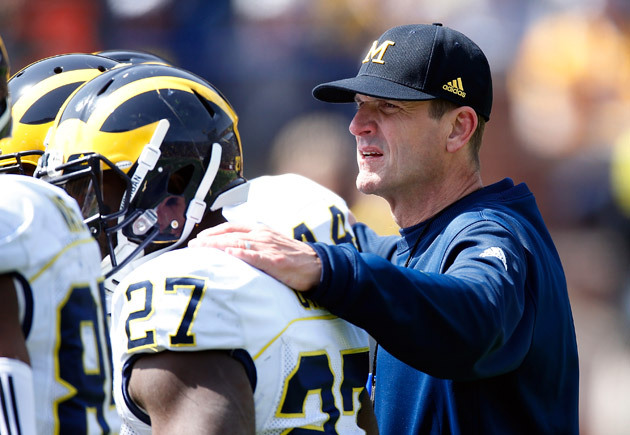 Harbaugh isn’t like those guys. He’s a little bit of a tougher subject. I suspect he is the way most of us would be if we constantly got interviewed. After hearing different versions of the same questions for the millionth time, most of us would shut down and offer either snide or boring responses. The way to get Harbaugh to give good answers is to pique his interest. That requires research—which anyone can do—and a bit of topic fishing, which someone doing a live radio show doesn’t have the luxury of doing. So don’t judge Harbaugh or Cowherd too harshly for what the men described as a “clunker.” Extracting information during a live broadcast is an inexact science. What you heard last week is the sound of the beaker exploding. 2. Ole Miss offensive tackle Laremy Tunsil and stepfather Lindsey Miller have sought charges against one another for an altercation late last month, and the fallout keeps getting messier. Miller told the Lafayette County Sheriff’s Office that the fight began when he warned Tunsil about contact with agents. Tunsil claims Miller pushed his mother, provoking a physical response from Tunsil. Miller’s comment on the incident report led to NCAA investigator Chris Howard visiting Oxford, Miller told Riley Blevins of The Clarion-Ledger. According to an incident report obtained by the paper, Miller told deputies that Tunsil had ridden away from the scene in a convertible with “agents.” Miller told the paper he is aware of NCAA violations involved with Tunsil’s recruitment as well as benefits provided to Tunsil by agents during Tunsil’s time at Ole Miss. 3. Noted rapper, producer and helicopter parent Sean “Diddy” Combs will not face a felony charge in connection to his arrest last week after an altercation in the UCLA weight room. Combs could still face a misdemeanor charge, but the Los Angeles County district attorney’s office announced last week that it will not pursue the more serious, kettlebell-related charges. This is probably fine with everyone in UCLA’s football complex. This situation has brought nothing but embarrassment to the program, and it only would have gotten worse had the case gone to trial. 4. Here’s something the UCLA program should be proud of: Last week coach Jim Mora and the Bruins offered a series of insider packages in return for donations to help Avery Huffman, the 6-year-old daughter of Scout.com recruiting analyst Brandon Huffman. Doctors discovered last month that Avery has a cancerous, inoperable brain tumor, and the Huffmans are trying to raise money to help cover her impending medical costs. UCLA’s athletic department offered two coach-for-a-day packages—one for a Bruins’ road game and one for a home game—that would allow donors to stay at the team hotel, attend meetings and have access to the locker room and sideline on game day. The road package costs $10,000; the home package costs $5,000. Both have already sold. Four fall camp packages remain. Those cost $1,500 each and allow the donor to spend two days and one night with the team during its preseason camp in San Bernardino. 5. Because of Nick Saban’s “one voice” policy, we don’t often hear from Alabama assistants. But when one grants a rare interview, it gets parsed like the Dead Sea Scrolls. Crimson Tide defensive coordinator Kirby Smart, who will be a head coach unless Alabama pays him more to remain a coordinator than anyone will pay him to be a head coach, gave a fantastic interview to Atlanta’s 680 The Fan last week. Here are some of the highlights. 6. Speaking of Ohio State quarterbacks, this is what Braxton Miller tweeted last week after an examination by orthopedic surgeon James Andrews, who is treating Miller’s throwing shoulder. Successful check up/visit w Kevin & Andrews! 😁. Miller told The Columbus Dispatch on Wednesday that he will speak to the media to update his condition soon, and the paper reported on Thursday that Miller will not transfer from Ohio State. So, that means Miller will either compete with Jones and J.T. Barrett for the quarterback spot or he’ll play another position in the offense. We’ll have to wait for Miller to tell us which option he is choosing. 7. Tennessee switched apparel sponsors from Adidas to Nike last week. Here are a few looks at the Volunteers’ new uniforms. 8. UAB coach Bill Clark told AL.com last week that he and the school are working on a long-term contract. Typically, I don’t support the coach-must-have-five-years-on-his-deal-for-recruiting logic, but in this case some level of coaching security is necessary for recruiting. In fact, the Blazers should give Clark seven or eight years. UAB’s leaders erased their football program following last season and then brought it back after a public outcry. Clark’s program is decimated, and now he must try to recruit players who will be made well aware of the decision to eliminate football and the subsequent flip-flop. If UAB hopes to have any chance at beating out any other FBS school for a recruit, it needs to show some type of commitment to football. A long contract for Clark might be the most effective way to show that. 9. Take a few minutes to read Austin Murphy's story on a Marine who has made a therapeutic return to college football at Division II Concordia-St. Paul. 10. The great Bruce Feldman of FOX Sports will unveil his annual Freaks list later this summer, but he threw out a teaser last week. That’s Arizona State guard Christian Westerman pushing out 20 reps at 315 pounds on the bench press. Yes. You read both of those numbers correctly. Before you clog my inbox, organizations that hand out postseason awards, please make sure you're on my Watch List watch list. Or just wait until some games have been played. Something about having breakfast for dinner feels slightly subversive to me. It shouldn’t, because in almost every city in America there is an IHOP, Denny’s, Waffle House or Huddle House willing to cook eggs or pancakes or hash browns at any hour of the day. Still, sitting down at 7 p.m. to order a biscuit last week felt a bit rebellious. I never cared much for the unwritten rules that dictate when we shall eat waffles and when we shall eat burgers, but my parents always seemed a little mortified when, as a high-schooler, I’d heat up chicken, green beans and mac and cheese for breakfast or eat waffles for dinner. For them, the lines that separated meals were clearly delineated. They never were for me. As you’ve probably guessed, I was a goody two-shoes growing up. Eating dinner for breakfast or breakfast for dinner was basically the limit of my rebellion. But it felt good. Maybe that’s why I was drawn to Philco, the upscale Columbus, Ohio, diner with a sign on the door that proudly proclaims the place is open for breakfast from 9 a.m. to 11 p.m.
Philco sits on High Street, meaning it is an easy walk for anyone bar-crawling through a Friday or Saturday night. Here’s a humble suggestion. Start your night with breakfast at Philco. They serve dinner entrées there, but why deprive yourself of the most important meal of the day (for the second time that day)? Order one of the local beers on tap or a cocktail, and then order a breakfast biscuit. The sandwich begins with a large, impossibly fluffy biscuit thick enough to withstand the flood of juice from the quartet of items wedged inside. The combination of a slab of chorizo, a fried egg, goat cheese and shallot preserves packs salty, sweet and umami into each bite. Some of the shallots will fall off onto the tray. You will scoop those up and devour them. Some bits of the chorizo will crumble and roll away after each bite. You’ll collect each one and reunite it with its biscuit neighbors. You may have also ordered the Johnnycakes, which are great. But that won’t matter. 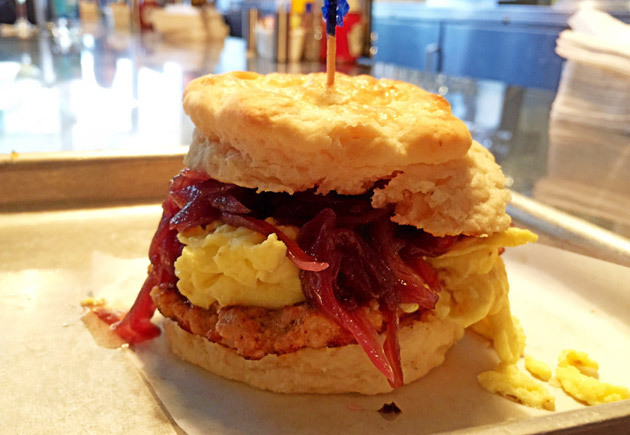 All you’ll want is another one of those biscuit sandwiches. You’ll crave it. It will call to you. And it won’t matter what time of day it is.